Photography backpacks for hiking need to be just as durable as any other type of hiking backpack, but should deliver a specific set of features that make taking photos a snap. Camera backpacks come in a range of sizes, to fit a wide variety of camera sizes. But don't let size be the only feature you consider when selecting the best photography backpack. Before you think features, first think about the type of photographer you are, or aspire to be. If you like to snap casual photos of your hiking escapades, you probably don't need a camera bag on every day hike. Your regular day hike backpack might have enough room for your camera in an outer pocket. And if your pack has a rain cover, your camera (or smartphone with a camera) will be well protected from the elements. Are you carrying a more robust camera, plus a tripod? Then you need a sturdy but comfortable pack that delivers lots of storage space along with rugged protection for your expensive camera gear. If you specialize in "catch the action" shots (think of a deer suddenly materializing on the trail), be sure you can get to your camera quickly without making a lot of noise. Do the zippers on the pack slide quickly? Is there a Velcro closure that you have to r-r-r-r-r-ip open? If you are all about cameras, maybe even carrying more than one at a time, or multiple lens with a tripod, then you really need to carefully consider how to squeeze comfort, durability, protection, and affordability into one little camera backpack. And don't forget enough room for your lunch and the ten essentials! Camera packs - how to choose? There are three good ways to go about finding the perfect photography backpacks for hiking..
Let's take a look at each, and mention a few down sides as well. Buy a pack based on the size of your camera and level of hiking expertise. Give it a try on your next hike. Return or exchange it until you find "The One". If you go this route, I'd recommend sticking with tried and true backpack manufacturers to minimize any return hassles. Some good choices are mentioned below. Just don't abuse their good humor. Read every review of photography backpacks for hiking that you can find. Start with REI Co-op's customer reviews. Based on your findings, narrow down your search to two or three options. Then go shopping, knowing that your pre-planning will shorten your trajectory to the perfect photography backpack for hiking. Chat up every photographer you meet on the trail. Ask not only which camera they use, but what they think of the camera pack they're using. If they're not using photography backpacks for hiking, ask what features they'd really love to see on a pack. Or how they've modified their hiking backpack to accommodate camera gear. When you find the hiker who matches your style of photography and your camera, use the camera pack they recommend. Why not leave the leg work to someone else? Definitely shortens your learning curve! I am a huge fan of Mountainsmith photography packs. They never seem to show wear and tear, the zippers and other closures never stick or jam, and they're comfortable to wear. REI carries their Spectrum Camera Pack. The price is reasonable, but note that you won't be taking this pack on long or arduous dayhikes. That's not really what it's built for. For more rugged hiking conditions, consider another trusted name in photography backpacks: Lowe. It has a detachable rain cover, plenty of internal organized compartments for your camera gear, and attachment points for a tripod. It will appeal to the hiker in you, with room for your 2 liter hydration reservoir, a rain cover, multiple attachment points for your trekking poles and tripod, and zippered pockets on the hip belt. Plenty of room for your camera, either mirrorless or DSLR with attached lens. Protect your investment by choosing the best method of carrying your camera gear on your next hike. Maybe all you need is a waterproof bag for your lightweight inexpensive camera. Even a ziplock bag might do it for you. Or maybe you need a dedicated photography backpack for your camera gear, with room for additional lensesa and a tripod. Don't carry more than you need, but definitely don't skimp on durability, convenience and weather proofing. 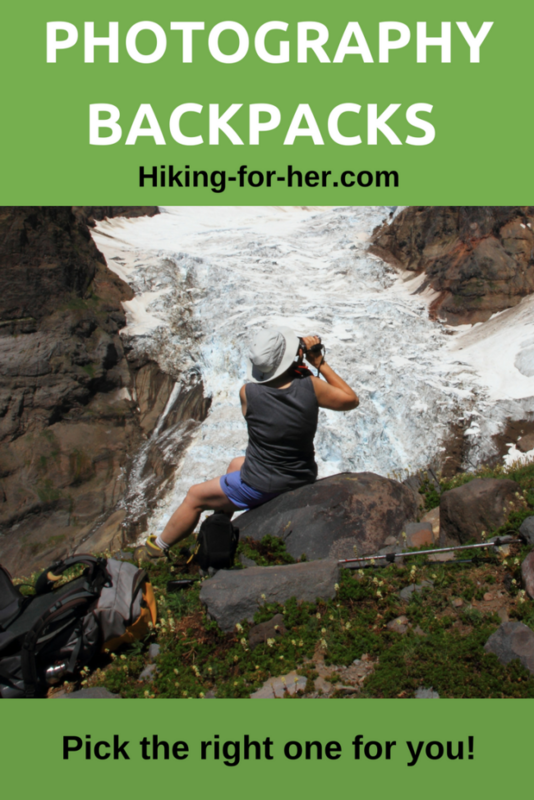 Looking for other types of backpacks for hiking? 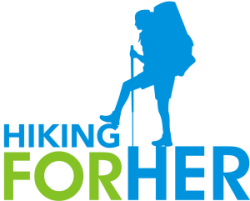 Affiliate links are the way Hiking For Her keeps hundreds of pages of hiking tips free and accessible to all. When you purchase hiking gear through one of these links, you don't pay extra, but a small percentage of your purchase price supports this website. Thanks for using the links, you are deeply appreciated!